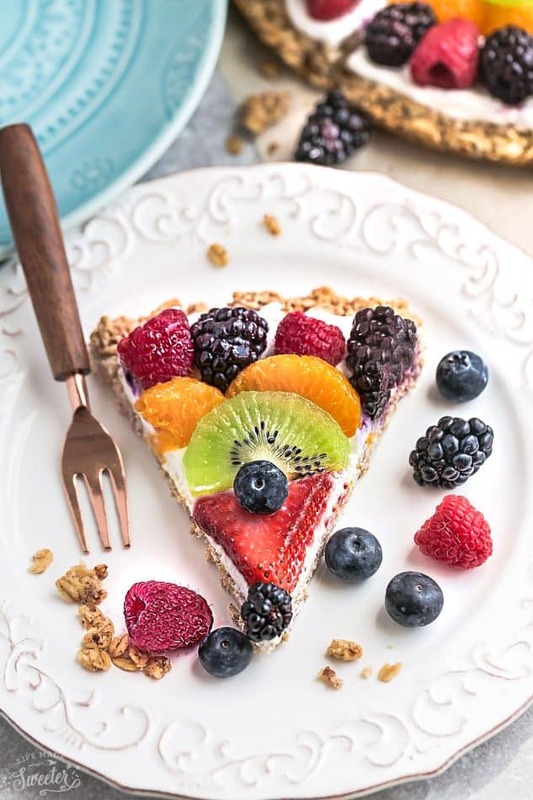 Healthy Fruit Pizza – 2 Ways – the perfect special breakfast, brunch or dessert. 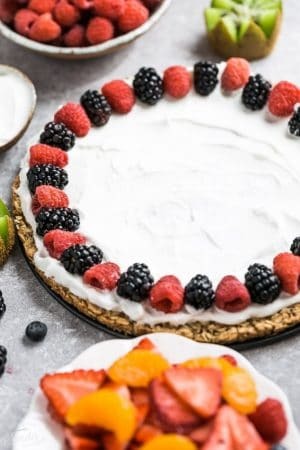 Best of all, this recipe is so easy to make with your favorite selection of rainbow fruit or mixed berries, a gluten free granola crust and Vanilla Greek yogurt. Plus recipe video! Pizza for breakfast? Yes please! Especially when it’s a healthy pizza that you can make in just 30 minutes. My kiddos are big fruit monsters so we always have fresh fruit around the house. 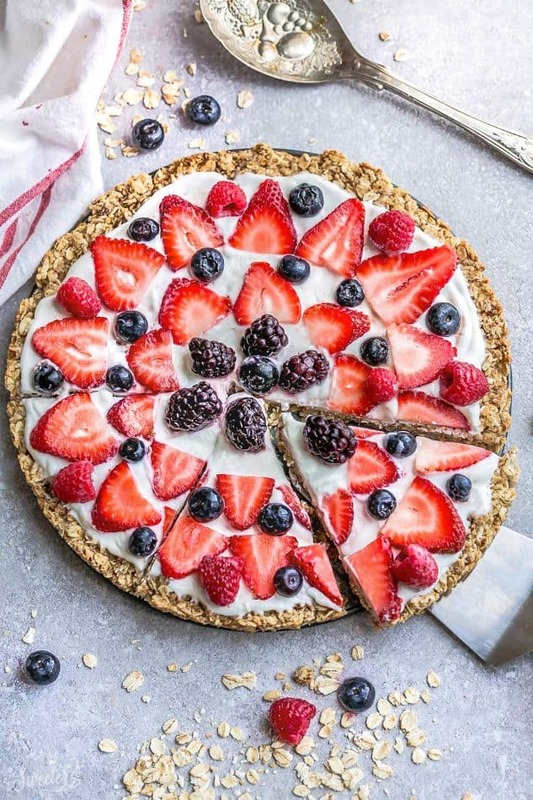 Now that berries are in season again, we couldn’t help tossing a bunch into this breakfast fruit pizza a few weeks ago. 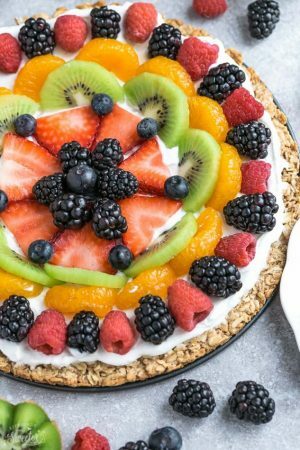 Plus with Mother’s Day and all the other summer events coming up soon, this fruit pizza would make a great addition to the breakfast, brunch or dessert table. 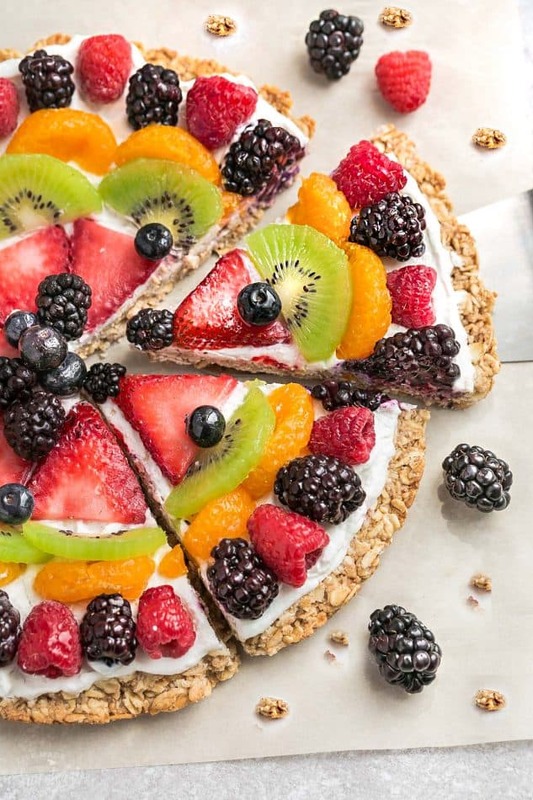 This Healthy Fruit Pizza is made with just a few simple ingredients you probably already have. The crust is gluten free, dairy free and refined sugar free. Oats, oat flour (almond flour would work as well) coconut oil and honey. The best part – you can customize it with your favorite yogurt and fruit. 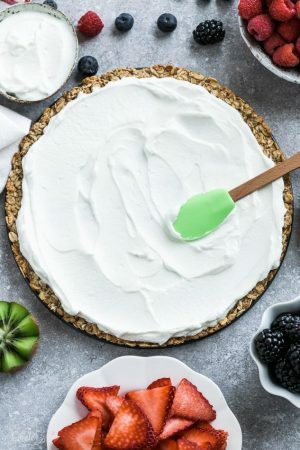 If you’re trying to keep this dairy free, you can use non-dairy yogurt or even coconut whipped cream which is amazing as well. But I think mango, grapes, pineapple or even some sliced bananas would be great as well! I also made a Red, White and Blue version HERE which I think would be perfect for Memorial Day and the Fourth of July! 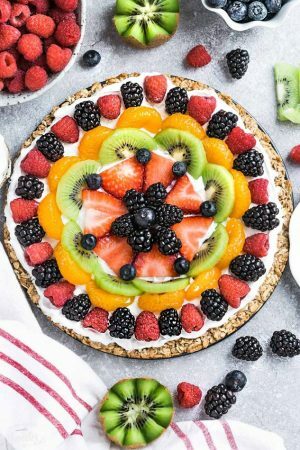 This fruit pizza would make an easy and healthy breakfast or a fun dessert for any spring or summer party! Make the crust the night before, and then layer with yogurt and fruit in the morning. 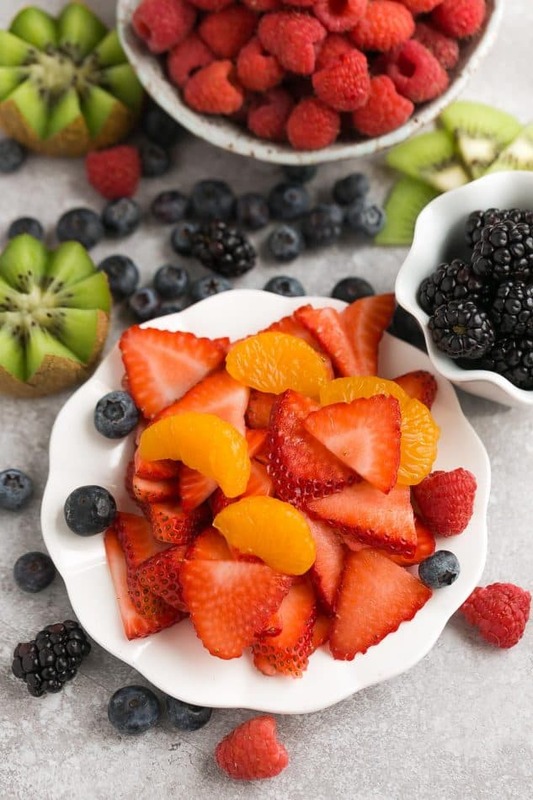 Have the fruit pre-chopped to save time. Get your kids to help you layer the yogurt and fruit! They’ll have fun being hands-on, and you can get another task done in the meantime. 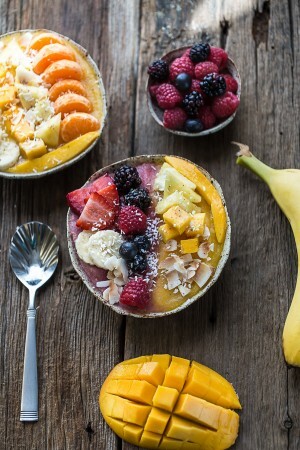 Healthy Fruit Pizza - an extra special breakfast, brunch or dessert. 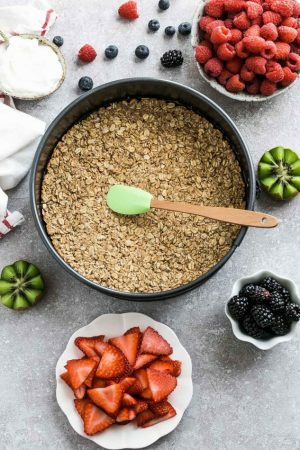 Best of all, it's so easy to make with your favorite fresh fruit, a gluten free granola crust and Greek yogurt. Grease a 10-inch cake pan with baking spray or line with parchment paper and set aside. In a large bowl, combine oats, oat flour, cinnamon, vanilla and salt together. Add the honey and coconut oil and mix until dough is combined and sticks together. Use your hands or a fork as needed. Spread the mixture into prepared pan and press down firmly with a spatula or the bottom of a glass cup. Bake in preheated oven for 10 minutes. Remove from oven and allow to cool completely (place in the refrigerator or freezer to cool faster). Meanwhile, in a medium mixing bowl, combine yogurt with honey and vanilla. Use an offset spatula to spread yogurt over cooled crust. 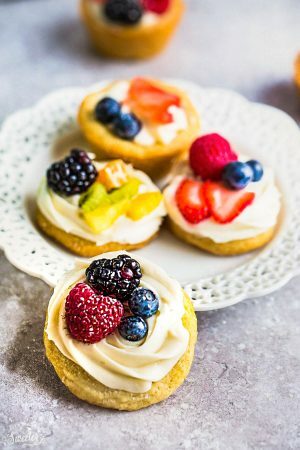 Decorate with your favorite combination of fruit. Enjoy immediately or place in the fridge to cool and set.